In the kitchen and at the market and sometimes far afield. Here are a few shots from my class at Kitchen on Fire on Saturday. It was fun. 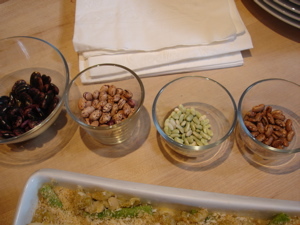 We had a really good turnout and at some point I realized that when you teach a class based on beans, whole grains, and fish, you're actually teaching a healthy food class. If we'd named it that, nobody would have come. Sorry E for not using your pictures. I just don't like putting pictures of myself up here. 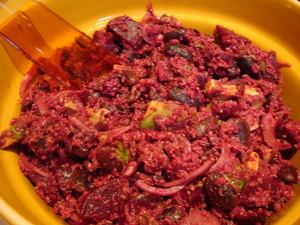 Beet Quinoa salad. 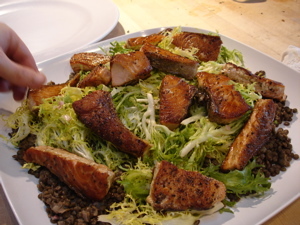 Good salad. Bad lighting. Bad picture. This entry was posted in classes. Bookmark the permalink. Post a comment or leave a trackback: Trackback URL. I wish I had known about this class. The recipes and images on this site belong to Vanessa Barrington. Feel free to link here and if you’d like to use a recipe or image, please ask permission first. Thank you. © 2019 Vanessa Barrington. All rights reserved. Powered by WordPress. Built on the Thematic Theme Framework. Photography by Sara Remington. Design by Deirdre Spencer.